• Marg Haycroft: in action during her final story time last Friday. 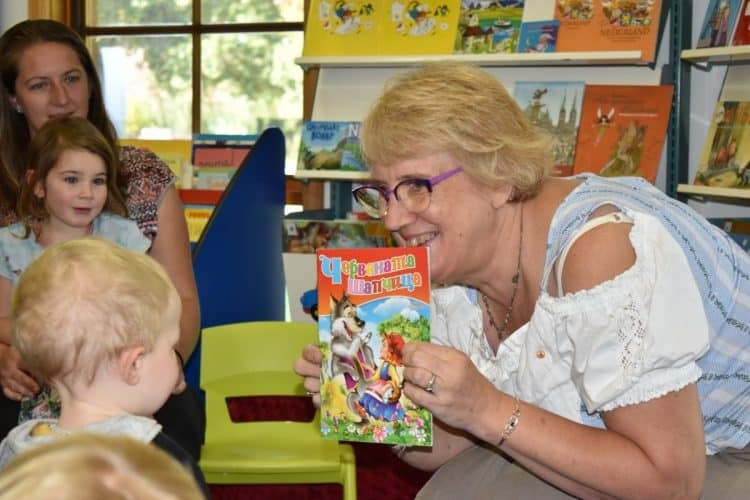 AFTER more than three decades, popular story time reader Marg Haycroft entertained her final group of pre-schoolers at Foster Library last Friday. Marg started way back in 1987, with stories in the bookmobile during school holidays, and story time in the foyer of the Stockyard Gallery (before there was a library in Foster). She was later employed by the Library to drive the truck and visit libraries, schools and kindergartens for Children’s Book Week and school holidays. Even when she left the library in 1996 to run the Foster Post Office, Marg was not far from stories or children as she entertained groups from local schools and kindergartens in the back of the Post Office with a story and song. She and husband Harley also carried a large range of children’s books, even holding a book launch. After the business was sold, Marg was able to get back into weekly story time at the Foster Library, and even conducted Baby Rhyme time and a Living Language Program at playgroups around Corner Inlet. Marg was very proud to receive an Order of Australia last year, particularly as the citation included her work with children in Corner Inlet. “It’s now time to hand on the baton to someone younger,” she said. Asked why she chose to become involved in story time in the very beginning, Marg’s answer was simple: “Because there wasn’t any.” “Stories build a love of reading. As much as anything else, it brings parents together. When you’re in a smaller community you’re engaging parents and getting them to meet each other,” she said.